$275.00 Road to Novotroitsk, a MASSIVE lithograph and gouache- on-paper work by Novichenko, circa 1980s-90s, portraying a humble yet picturesque landscape dotted with signs of industrialization through a unique combination of Socialist realism and the artist's own sentimental touch. $450.00 The First Blast Furnace, MASSIVE color lithograph/raised print by Novichenko, circa 1980s-90s, depicting Soviet factory workers on duty, dwarfed by the monumental scale of their industrial surroundings. 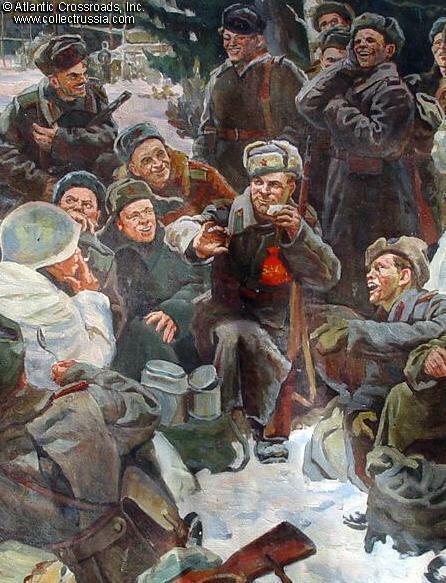 $750.00 Liberators, WW2 Red Army infantry marching through a recently captured area somewhere in East Europe, oil on canvas, either an original painting or possibly a hand-painted Soviet period reproduction of a 1940s-50s original by an unknown artist. Very large format, about 4' x 6 ½'. $900.00 Construction Workers, Socialist Realism painting, oil on canvas, circa 1970s-80s. Very professionally done, apparently original piece by an unknown Soviet artist. Measures 57" x 39". In excellent condition. $400.00 Autumn Park, original oil painting by signed by artist L. Chesnokov, 1980. Moody landscape in Socialist Realism style. Measures 55" x 41".